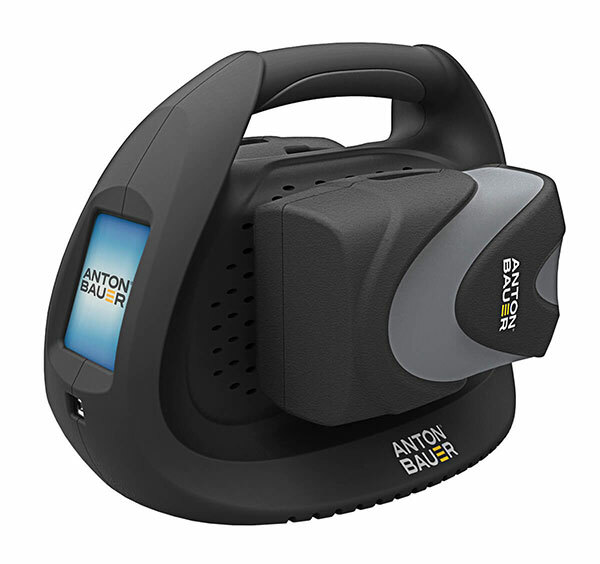 Anton Buaer's Performance Dual Gold Mount Charger (Part #84750120) offers sequential/simultaneous charging for Gold Mount batteries. Using the ergonomic top handle, users can easily move, re-position, and transport the unit — even with a battery affixed to each side. This model features one handed battery removal and a touch screen activity/status indicator. Part of Anton Bauer's 'green' line, this charger uses a charging algorithm that is reportedly 40% more efficient than traditional chargers. Also, the charger will automatically detect and prioritize the battery with the strongest charge — bringing the user a fully charged battery in the shortest amount of time.